Stretching along the Cantabrian coast with the city of Santander at it's centre, the Costa Cantabria offers a variety of beaches, all with golden or white sand, from almost within the city, to hidden coves approaced via a cliff path, particularly the section to the east of Santander. There are fishing villages and small towns that are only been slightly affected by the influx of tourists. 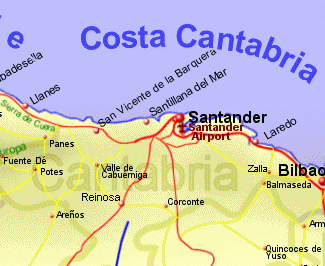 Notable towns along this stretch of coast starting from the west include San Vicente de la Barquera, Santillana del Mar, Santander, Santona, Laredo, and Castro Urdiale. Inland, there are green fields and the Cantabrian mountains for those that want a change from the coast. The Costa Cantabria is serviced by Santander airport, or via the ferries to Santander and Bilbao.